When he was 16 he inveigled his way into a Sydney hotel to hang out with the Rolling Stones. From that day on, Richard Clapton knew he was going to be a rock star. It's now almost 50 years since that fateful day -years filled with a lifetime of incredible experiences, outrageous good times and a catalogue of iconic and timeless songs. Through the glory years of rock'n' roll, in cities as varied as London, Berlin, Sydney, Los Angeles and Paris, Richard forged his own career and built up a significant body of work while living, loving and partying with the biggest names in the Australian and international music world. By his own frank admission, these were years fuelled by prodigious quantities of alcohol and drugs, set against a backdrop of constant recording and touring, of endless partying and wild times. It was to be a rollercoaster ride of euphoric highs and deep, shattering lows. 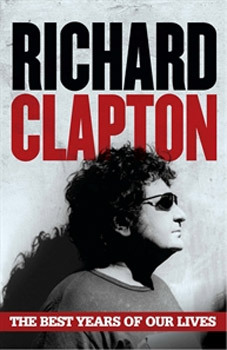 For 40 years, Richard Clapton has been, above all else, a songwriter-a wry observer of human behaviour and an astute commentator on the Australian condition. His best songs- 'Deep Water', 'The Best Years of Our Lives', 'Goodbye Tiger', 'Glory Road', 'Lucky Country', 'Girls on the Avenue', 'Trust Somebody' and 'Capricorn Dancer'-capture the essence of this country and the meaning of our lives like few others. In this extraordinary memoir, Richard employs his songwriter's keen powers of observation, portraiture and storytelling to tell the best story of all: the remarkable one of his own life. Outrageous, funny, insightful and poignant, this is the rock memoir to beat them all. In celebration of 40 years of fabulous music and iconic songs, welcome to The Best Years of Our Lives. Australian rock music historian, Ian McFarlane described Clapton as "one of the most important Australian songwriters ". On 12 October 1999, Clapton was inducted into the Australian Recording Industry Association (ARIA) Hall of Fame. In 2014 he will be celebrating 40 years in the music industry.